The machine MC is the result of years of direct experience in the field of resin for casting, incorporation and make adhesive by means of bicomponent materials. The equipment doses, mixes, dispenses and offers the possibility to have a fixed or variable mixing ratio (MC-VR model). 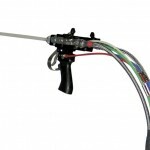 The easy construction and the high reliability are the characteristics that allow a standard high quality work combined with a particular easiness of use and handling. 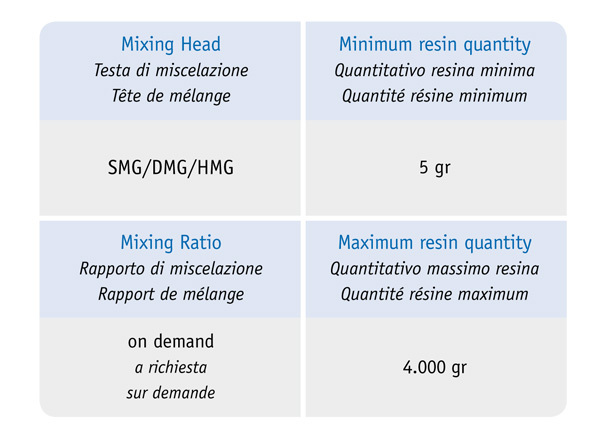 The machine MC has different types of mixing heads that can be assembled according to the material used for the resin-casting. 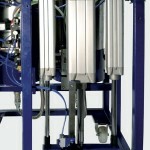 The mixing gun chambers may have separate pipes with disposable static mixer  or the cleaning by solvent. For more complex products, it is possible to fit a head with the dynamic mixer. 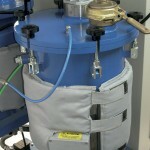 If necessary it is possible to spray the quantity of resin in dispensing, mounting adapters on the mixing chamber. 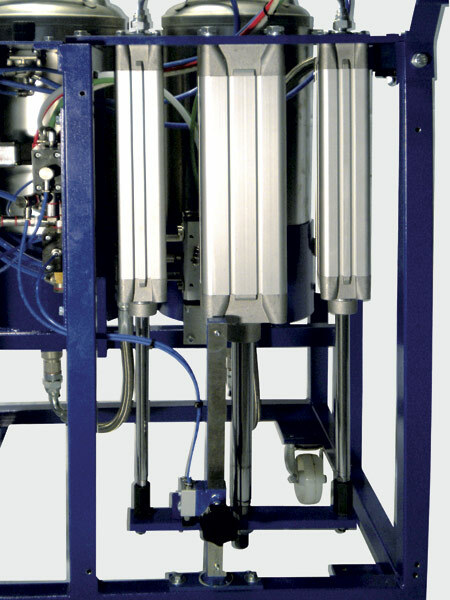 The dosing system is defined according to the quantity of resin to dispense; it is used the piston cylinders  or the plunger road (for very small quantities). 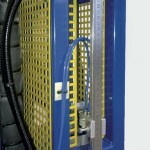 The cylinder loading is ensured by pressurized tanks. 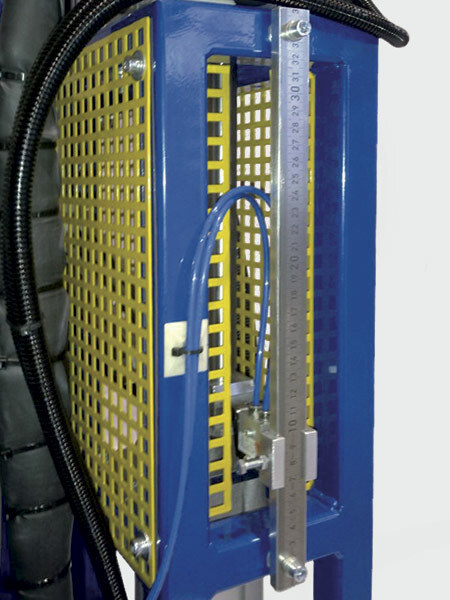 In the case of variable ratio, the machine is structured with a cylinder which fastening changes mechanically with respect to a fixed one, modifying the volumes. 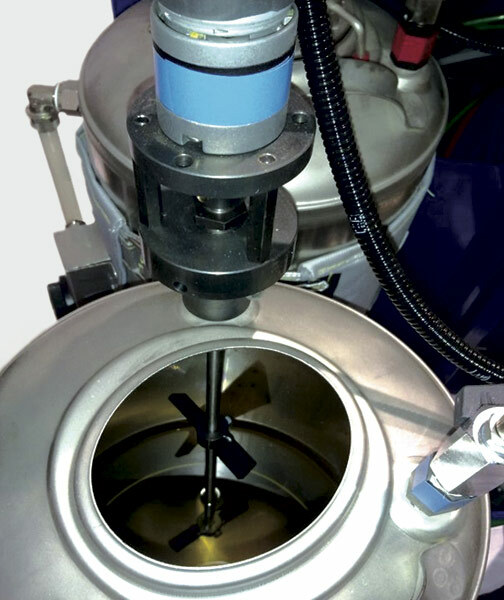 The dispensed quantity adjustment is controlled by a completely pneumatic logic, with a micro limit switch fixed to a dipstick , so to have a perfect repeatability of dosing. 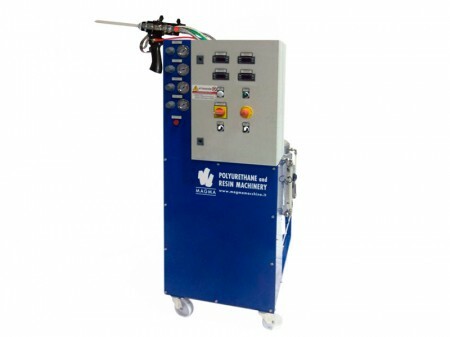 If it is necessary to heat the products for resin-casting, it is possible to prepare the tanks and pipes for heating and cooling with a temperature controller, automatically managed by dedicated thermoregulators. 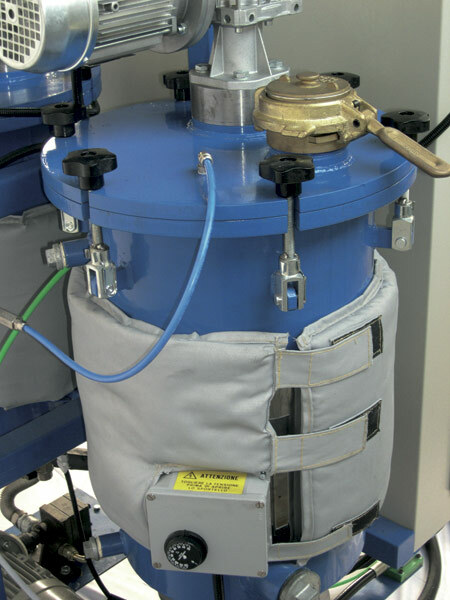 The various models have tanks with different working pressures, both positive and negative  and they can be equipped with mixers and anti-humidity filters. 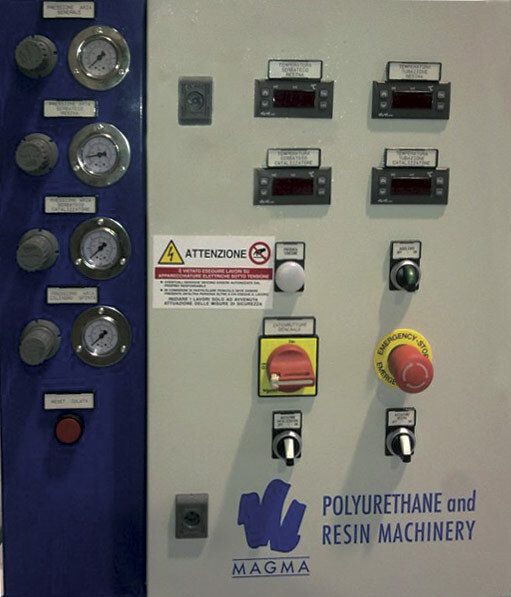 To meet any operational need, it is possible to implement the process of resin-coating of the machine MC, building customized systems, with different degrees of automation and control. The machine can be integrated in production lines equipped with manipulators, transport belt or rollers that Magma can directly project and construct. 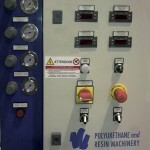 USED RESIN: Polyurethanic, epoxydic, phenolic, silicone and other resins (after workability assessing). RATIO: Fixed or variable, as requested. TANKS: Standard and pressurized 9/18 l and other capacities on request. 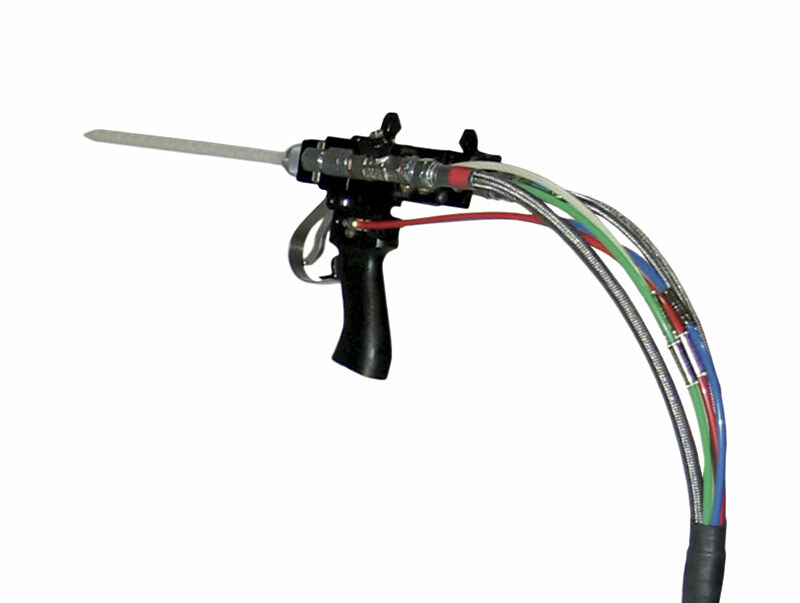 MIXING HEAD: Fixed or manual with static system SMG/HMG or dynamic one DMG. OPTIONAL ON REQUEST: Tank and pipe heating. Cleaning with solvent. 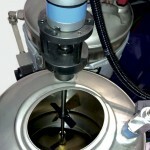 Tank degassing.